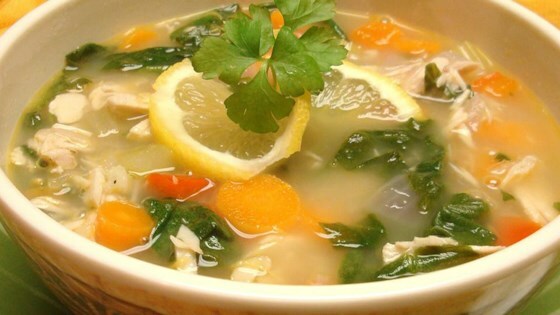 "A wonderful, light soup perfect for the post-holiday turkey leftovers. The lemon in this recipe makes your palate zing, and it is so friendly on the waist-line when you need a 'light' meal after the heaviness of the holidays. Enjoy!" Heat olive oil in a pot over medium heat. Cook and stir onion and garlic in hot oil until fragrant, about 2 minutes. Add carrots, celery, and red bell pepper; cook and stir until carrots begin to soften, 8 to 10 minutes. Pour turkey stock into vegetable mixture and bring to a boil. Reduce heat to low and simmer until flavors blend, about 20 minutes. Stir cooked turkey, lemon juice, and lemon zest into turkey stock mixture; simmer until heated through, about 5 minutes. Add spinach leaves, salt, and black pepper; simmer until spinach wilts and turns bright green, 1 to 2 minutes. Made this soup x2...it was wonderful. I added another 1/2 cup of Turkey and 1/2-3/4 cup liquid to broth. Lemon flavor is evident but not too strong. Needed more than 2 cups of liquid, I ended up adding 2 more cups. It was a little lemonie for my taste, if I make it again, I will add a little less Lemon juice. Nice change of pace. The lemon is fresh tasting, but not overwhelming. Deliciousness! Followed the recipe exactly. Great with leftover turkey.